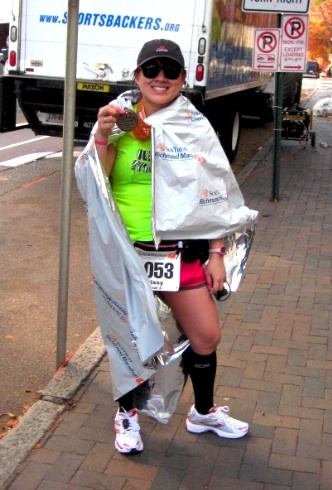 My first 26.2: The 2011 Richmond Marathon. I mean, really. I never imagined I would run one (let alone multiple) but as I started to think about it this past week of tapering miles, I started to think about it: the marathon has become so much more than running 26.2 miles down the streets of another town, with thousands of my closest friends – it’s a sort of culmination, or celebration, of something so important, so exciting…and so hard to explain – all at the same time. You see, those 3, 4, 5, or 6+ hours of running – they might be powered along by funny little packets of sugary Gu, but the real fuel is the dedication you put in – hours upon hours, hundreds of miles, and gallons of blood, sweat and (for me anyway) tears – that’s what will get you through it. And no matter what that clock says at the end, each time you finish that journey – whether it’s your 1st, or your 100th – it’s worth it all. In a perfect world, I wish everyone in the world could experience this magic firsthand, but as optimistic as I like to be, I know that it’s just not realistic. But you know what is? FINDING A PASSION. Finding that thing that lights a fire inside of you, that drive to accomplish something that is bigger than you, changing your life for the better…finding your marathon. Note from Krissy: 26.2 with DONNA, is coming up this Sunday, 2/23. In addition to training, I have been fundraising and am less than $200 from my personal goal of $2000. 100 percent of all proceeds are donated to research and care – the only breast cancer marathon in the country to do so. It is my honor and privilege to share my passion and energy to this cause, and I appreciate your support in reading and sharing my campaign. To donate any amount today, please visit My Fundraising Page. Thank you. Such a great post and I feel like you’re in my head this morning. I have the day off and finally am getting around to organizing (and ordering) our photos from Dopey. As I looked through the professional photos from the marathon, I relived the profound joy (and pride) that I felt at the end of that race. I found myself thinking “when can I run another marathon? why haven’t I scheduled one yet this year?” All those things they say about a marathon being a triumph of the human spirit are so very real. The laborious training really melts away on race day and the minute you cross the finish line. So excited for you, Krissy! I will certainly be channeling good thoughts to you while I’m running Disney! I have tried to train for two marathons and had running ending injuries both times 😦 I would really like to do one, but am certainly afraid given my past attempts. Finding the time to train would be tough – would have to plan the time of year strategically, thats for sure! What do you mean you never imagined you would run a marathon? You are an awesome runner (not to mention speedy)!. Last month I ran my 1st marathon and I too never thought I would run one. And the first marathon was to be “one and done” sorta thing. Yet now here I sit seriously considering signing up for another. You are right: it’s magic, it’s worth it. I’ve learned that I can do so much more than I thought possible – and that goes for everyone else too! If you try, you can do amazing, impossible things!